But David can only take half the credit for her Season 18 DWTS victory. 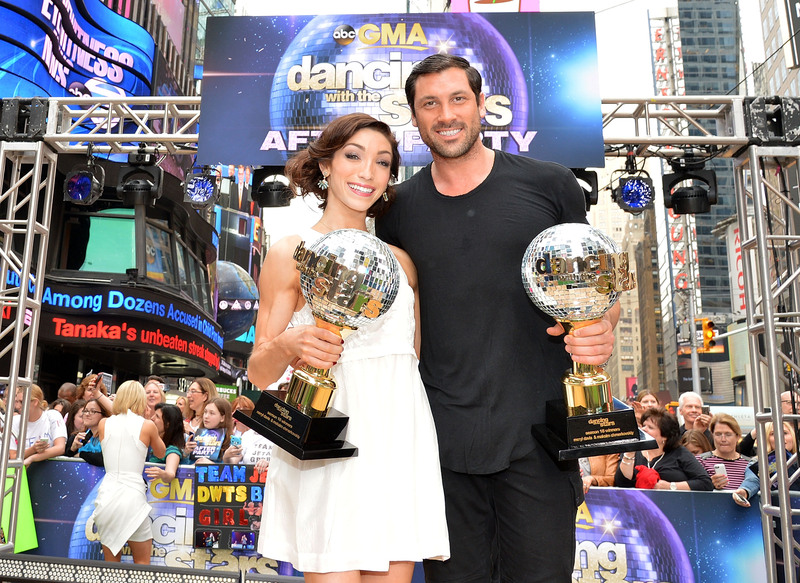 The other half belongs to her professional dance partner, Chmerkovskiy. Maks has competed on DWTS 14 times (! ), but he's only won with Meryl. Granted, being a professional ice dancer is like being a professional regular dancer except even harder, so Meryl and Maks had a leg up on the competition from the get-go. Their obvious sexual chemistry didn't exactly hurt their popularity with fans, either. According to their Instagram accounts, Meryl and Maks still hang out, which is only helping to fuel rumors that they've become an official item, though nothing is confirmed. Well, I guess maybe all my DWTS dreams can't come true. Maks is not returning for Season 19 (which begins Monday), so fans' memories of his perfect ballroom technique with Davis won't be clouded by whoever Maks works with next. Davis is also moving on to bigger and better things. She and Charlie White spent part of the summer ice dancing in Japan at The Ice 2014, a skating show. Then Davis came back to the states in time for the Mirror Ball Tour, during which the most recent DWTS winner brings her trophy to various cities to promote the new season. Funnily enough, Season 19 features another Sochi Olympian: Lolo Jones, who was on the American bobsled team (she also competed in the 2008 and 2012 summer Olympics as a hurdler). Jones didn't perform nearly as well as Davis did at the Olympics, but maybe she'll follow in her footsteps on Dancing with the Stars. Without Maks as a partner, though, it'll be difficult for Jones to get a fan reaction anywhere close to Davis'. We'll have to wait until the new season gets underway to see who our new favorites will be. But it will have to be someone really special to take over Meryl's reign.